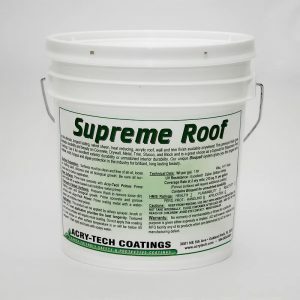 Supreme Roof is the ultimate, longest lasting, velvet sheen, acrylic roof finish available anywhere! 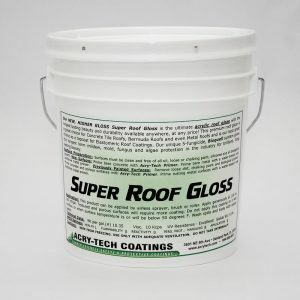 This premium roof finish gives fantastic durability and beauty on Concrete Tile Roofs, Bermuda Roofs, Shingle Roofs and is a great choice as a topcoat for Elastomeric Roof Coatings, camper roofs or other surfaces. Our unique Bioquell™ system gives you the longest term mildew, mold, fungus and algae protection in the industry for brilliant, long lasting beauty. AVAILABLE IN PURE BRIGHT HEAT REFLECTING WHITE! 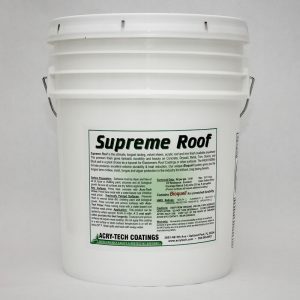 Supreme Roof is uniquely suited for roofs made from concrete tiles, clay tiles, poured concrete, Bermuda (formed concrete) or other cementitious substrates. 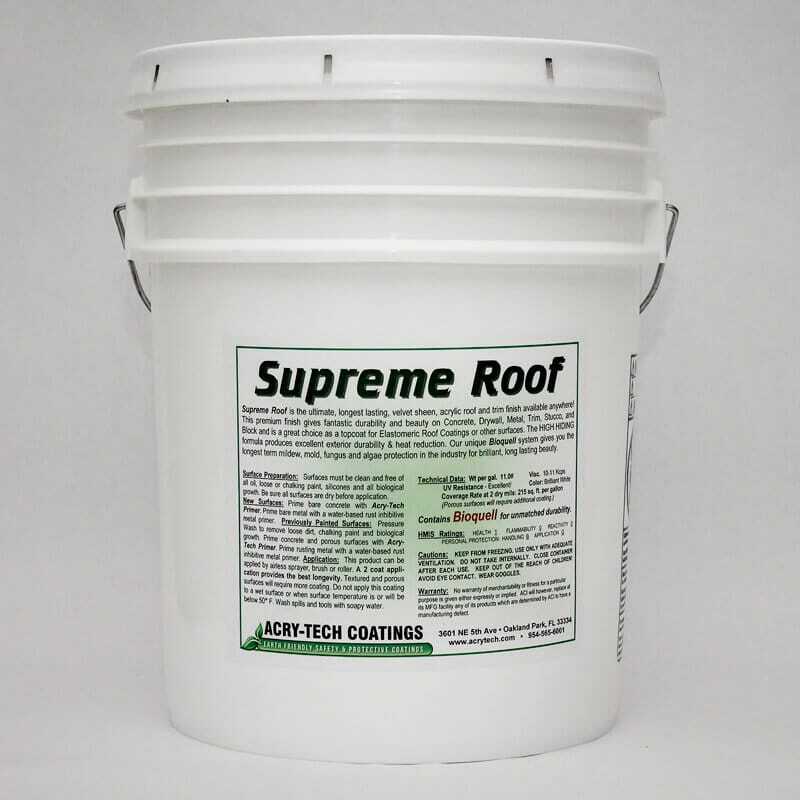 Supreme Roof is impervious to high alkalinity of cement and lasts much longer than cheap vinyl paints. Another great use for Supreme Roof is as a topcoat over Elastomeric Roof Coatings. Use it on coated tile, shingle, or even metal roofs that have been sealed with our Elastomeric System. Supreme Roof penetrates the substrate, gaining a tenacious bond and providing a protective layer of high performance Acrylic durability enhanced by the high concentration level of our Bioquell™ Biocide System. Then, the pure white titanium dioxide that gives Supreme Roof it’s brightness reflects the sun’s heat and shrugs off the UV that kills ordinary paints. Supreme Roof is as powerful formulation designed to be the ultimate Satin Finish Roof Paint. The Acrylic resin was chosen because of its superior weatherability, tenacious adhesion and toughness. Then we coupled it with our powerful Biocide called Bioquell™ to fight off the ravaging effects of Mold, Mildew, Algae and Fungus. Supreme Roof has no peers in the Roof Paint Market! Supreme Roof helps keep your roof cooler, helps it stay bright white and lowers your maintenance and air conditioning costs. 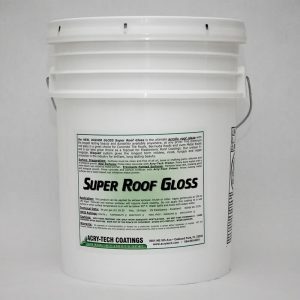 You save MONEY by using the best because you won’t have to repaint as often and your roof will stay cleaner longer. Your home can have the best looking roof in the neighborhood! Surfaces must be clean and free of all oil, loose or chalking paint, silicones and all biological growth. New Surfaces: Prime bare concrete with our AquaGuard Bonding Primer. Prime bare metal with a suitable corrosion resistant metal primer. Previously Painted Surfaces: Remove loose dirt, chalking paint and biological growth. Prime porous surfaces with our AquaGuard Bonding Primer. This product can be applied by airless sprayer, brush or roller. Apply generously with overlapping strokes. Textured and porous surfaces will require more coating. Do not apply this coating to a wet surface or when surface temperature is or will be below 50°F. Wash spills and tools with soapy water. Available in 1 or 5 gallon pails. Recommended Coverage Rate: 200 sq. ft. per gallon over an Elastomeric Coated Surface or 150 sf/gal over bare, primed concrete or 100 square feet per gallon on porous concrete tiles. KEEP FROM FREEZING. USE ONLY WITH ADEQUATE VENTILATION. DO NOT TAKE INTERNALLY. CLOSE CONTAINER AFTER EACH USE. KEEP OUT OF THE REACH OF CHILDREN! AVOID EYE CONTACT. WEAR GOGGLES. No warranty of merchantability or fitness for a particular purpose is given either expressly or implied. ACI will however, replace at its MFG facility any of its products which are determined by ACI to have a manufacturing defect. Available in 1’s, 5’s or in drums. After using the primer the paint went on well and dropped my roof temp inside the home 15-20 degrees. I used this on asphalt shingle. Only con I had was the amount of spread indicated and actual. It states 175-200 sq ft a gallon I was maybe getting half those numbers. I’m extremely happy with the results and the white roof doesn’t look that bad. I live in southern California so I get the sun beating on the roof 365 days a year.